Cuyahoga Community College (Tri-C) is pleased to present a benefit concert featuring young musicians of today on their journey to becoming tomorrow’s jazz legends. 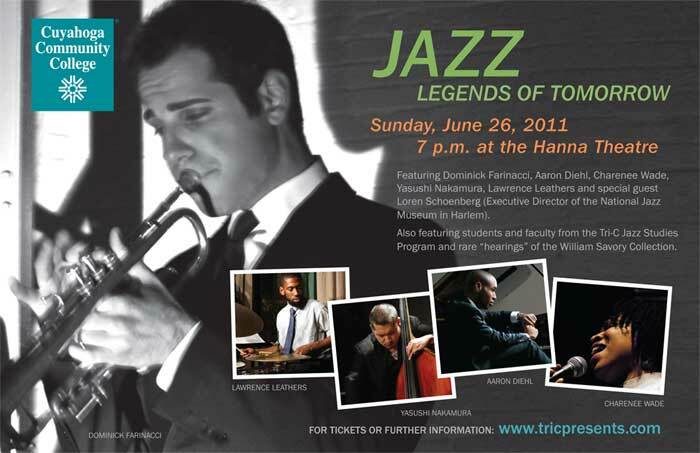 Cleveland’s own Dominick Farinacci and his New York band, with Aaron Diehl (2011 winner of the American Pianists Association Cole Porter Fellowship), bassist Yasushi Nakamura, drummer Lawrence Leathers, and vocalist Charenee Wade (second runner up at the 2010 Thelonious Monk Competition), will take center stage Sunday, June 26, at 7 p.m. at the Hanna Theatre at PlayhouseSquare in Cleveland. They will be joined by Loren Schoenberg, the Executive Director of the National Jazz Museum in Harlem, as well as students and faculty from the Jazz Studies Program at Tri-C.
Partnerships with the National Jazz Museum in Harlem as well as Berklee College of Music demonstrate the significance of the Tri-C Center for Creative Arts as a serious place for the study of Jazz in the Midwest. Tickets are $25 for general admission seating and can be purchased by calling 216-241-6000 or 866-546-1353, or by visiting Playhouse Square ticketing. VIP Benefit tickets, which provide premier seating and a Music Lovers Reception, are also available and can be purchased by calling 216-987-4868. This benefit concert is supported as a growing commitment to jazz education and the development of world-class musicians in Northeast Ohio. This entry was posted in Art News, cleveland, jazz, music, ohio, shows and tagged art news, CJO, cleveland, Clevelnad Jazz, concert, live, music, ohio, Orchestra, show. Bookmark the permalink.